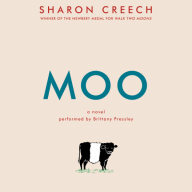 CREECH, Sharon. Moo. 2 CDs. 2:32 hrs. HarperCollins. Nov. 2016. $19.99. ISBN 9781470853624. 1 MP3-CD; digital download.